There is nothing more heartwarming than a child who speaks from the heart! In the adorable video below, a six-year-old girl gives her mom some incredible advice about how to handle the split with her father. Her words are so mature for a kid of her age and in fact, we all could probably learn something from her advice to her mother. When things go sour and get heated between parents, usually it’s the children, who suffer the most. And that’s exactly what happened with this little girl. “Can’t we all just get along?” This is what exactly this kid was thinking after her mom got a divorce and she begs her mom to get along with her father. So amazing, isn’t it? 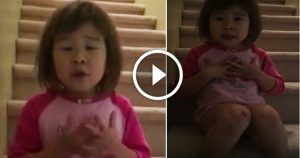 This little girl has stolen hearts all across the world after her mom uploaded this video on social media which went viral last year. According to her mother’s post on Facebook, she had been fighting with her ex which when her daughter stepped in. She then started filming her daughter’s plea.